In my last post, I reminded you that the Sale-a-bration ends on March 31st, and the Mini Occasions Catalogue ends on April 30th. 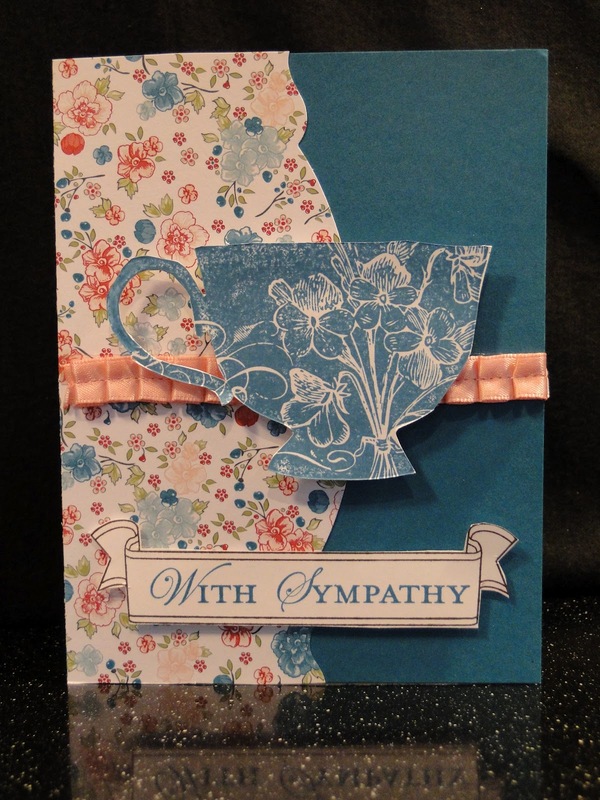 Today, I thought I’d share with you some cards that I have made with some of the wonderful Designer Series Papers and Stamps from these 2 catalogues. 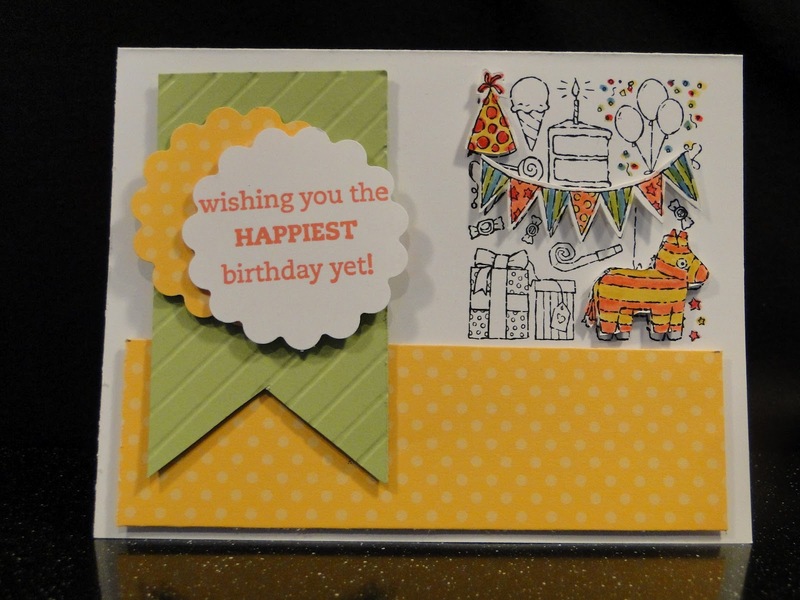 This stamp set ‘Packed for Birthday’ is also in the Occasions mini (item#125746)(w)$11.95) Here, I chose to highlight certain parts of the stamp by double stamping, colouring, cutting out & adhering them on top. I love this new set from the Occasions called ‘Mixed Bunch’ (item#125535 (w)$33.95 or 125537 (c)$26.95 set of 6) You can use the flowers seperately or layer them. The great thing is there is a matching Punch for the flowers – the ‘Blossom Punch’ (@125603 $22.95) which makes using these a cinch! You’ll notice the lovely scalloped edging on the right side – done with the wonderful new ‘Adorning Accents’ Edgelits Die (#125595 $11.95 2 styles). Here I’ve layered the ‘Everyday Enchantment’ striped DSP (#126154), the 1/8″ Organdy ribbon in Calypso Coral and 3/8″Printed Designer brads(combo ribbon & brad pack #127279)-all which can be earned for FREE from the SAB Catalogue! 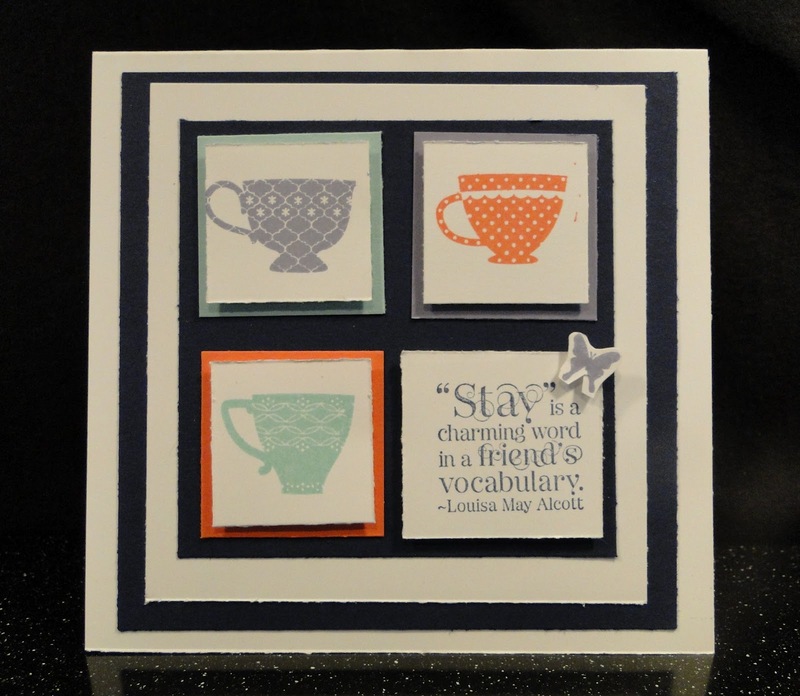 Can you tell I love the ‘Tea Shoppe’ stamp set?! The sentiment was stamped using ‘Loving Thoughts’ set (#125843 (w)$36.95 or 12845(c)$28.95 set of 11) onto the banner stamped & cut out from ‘Take it to Heart’ set (#125520(w)$35.96 or 125522(c) $28.95) Behind these is the DSP ‘Twitterpated’ (#125406 $13.50-12 sheets; 2ea of 6 double sided 12×12 papers) and the gorgeous 3/8″ Pleated Satin Ribbon in Blushing Bride (#125570 $9.50 approx.5yds) To achieve that wonderful scallop edge on the DSP, I used the 2nd of the two Adorning Accents Edgelit dies (#125595 $11.95) Everything used for this card is from the Occasions Mini Catalogue. ‘Gnome Sweet Gnome’ is a cute set from the Occasions Mini (#126535 (w)$33.95 or 126537 $26.95(c) set of 12) I punched the clouds using the Cupcake Builder punch from the Idea Book & Catalogue(#121807 $22.95) -the centre cloud is from the Everyday Enchantment DSP (#126154) FREE from the SAB Catalogue. I used the #125572 Lucky Limeade and #125573 Calypso Coral Baker’s Twine ($3.95ea, 25yds) from the Occasions Mini. So you see, there are many, many wonderful products available (this is just a tiny sampling!) which can be used in many different ways! We won’t know which items may be carried over to the new Annual Catalogue in June – wouldn’t you rather get it now, than be disappointed later? And if you can earn it for FREE now – even better! Previous Previous post: 15 DAYS LEFT OF SALE-A-BRATION! Next Next post: Getting Ready for Easter Card Classes! I LOVE thee cards. They are really an inspiration.